Russian President Vladimir Putin said Saturday global cooperation was need to confront terrorism in the wake of an Islamist militant attack targeting foreigners in a luxury hotel in Mali that killed 19 people. The assault on the Radisson Blu hotel, claimed by jihadist groups Al Mourabitoun and al-Qaida in the Islamic Maghreb (AQIM), ended when Malian commandos stormed the building and rescued 170 people, many of them foreigners. The head of a Bamako hospital told Russian television channel LifeNews that at least two Russian citizens were killed. RIA news agency said Russians were among the dead, citing Foreign Ministry spokeswoman Maria Zakharova. In a speech on the sidelines of a summit with Asian nations in Malaysia, U.S. President Barack Obama described the raid in Mali as "another awful reminder of the scourge of terrorism." 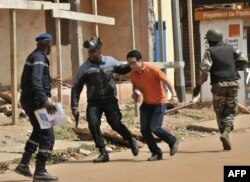 Malian security forces evacuate a man from an area surrounding the Radisson Blu hotel in Bamako, Nov. 20, 2015. The attack was another jolting blow to France after the shock of the Paris carnage. France has stationed 3,500 troops in northern Mali to try to restore stability after a rebellion in 2012 by ethnic Tuaregs that was later hijacked by jihadists linked to al Qaeda. "We (France) have proved to be as blind as the Malian elite. Nothing changes in Mali. The elite continues to act like it always has as does the international community," said Laurent Bigot, former undersecretary in charge of West Africa at France's foreign ministry, alluding to U.N. peacekeepers. Malian troops take position outside the Radisson Blu hotel in Bamako on November 20, 2015. Gunmen attacked the luxury hotel in Mali's capital Bamako, seizing 170 guests and staff in an ongoing hostage situation that has left at least three people dead. Al Mourabitoun has claimed responsibility for a number of attacks, including an assault on a hotel in the town of Sevare, 600 kilometer (375 miles) northeast of Bamako, in August in which 17 people including five U.N. staff were killed. In the wake of the Paris attacks, an Islamic State militant in Syria told Reuters the organisation viewed France's military intervention in Mali as another reason to target France and French interests.